What: Shares of Cal-Maine Foods (NASDAQ:CALM) the nation's largest egg producer, spiked by 27% in May, according to S&P Capital IQ data. Shares are now up 55% in the last year, reaching new all-time highs. So what: Investors are betting that a U.S. outbreak of bird flu will have a hugely positive effect on Cal-Maine's business. The disease has so far struck 46 million chickens and turkeys across the country, according to the U.S. Department of Agriculture. Bird flu has also hit a significant portion of the nation's egg-laying hens, which is pushing egg supply down and causing prices to spike to record highs. In fact, industry researcher Urner Barry told Bloomberg that eggs are now twice as expensive as they were just one month ago. Now what: Cal-Maine's operations are highly sensitive to supply and demand changes in the egg industry. 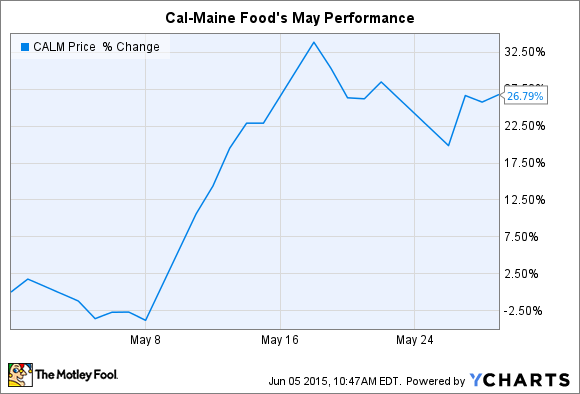 Last quarter, for example, a 6% rise in egg prices powered a 10% revenue spike for Cal-Maine. That's why a historic doubling of egg prices would likely translate into huge revenue and profit gains for the egg producer. Wall Street analysts have recently jacked up their earnings targets for the quarter that just ended for Cal-Maine. Three months ago the average profit estimate was for $0.73 per share; today, the forecast sits at $0.95 per share. The positive egg pricing environment might boost Cal-Maine for some time. It could take as long as two years to get the country's hen flock back up to a normal level. In the meantime, Cal-Maine needs to protect its own flock from the bird flu outbreak and reap the benefits of sharply higher prices for its products.